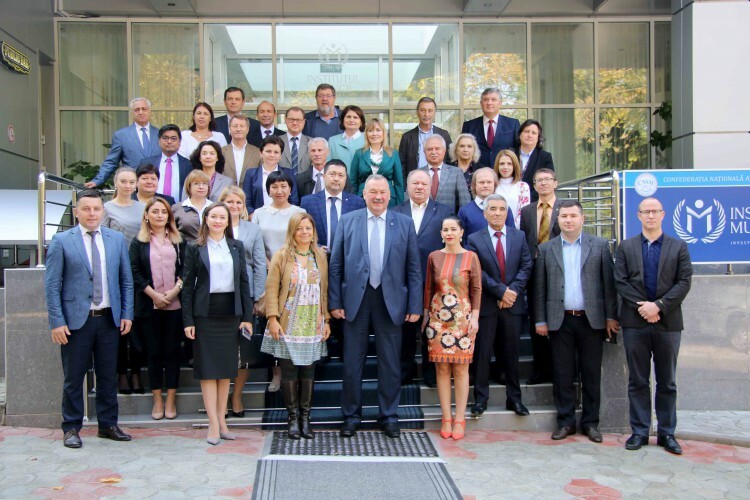 The International Labour Organization (ILO), the Pan-European Regional Council of the International Trade Union Confederation (ITUC / PERC), in partnership with the National Trade Union Confederation of Moldova (CNSM), organizes during 09 – 10 October a regional seminar on Sustainable Development Goals (SDGs) and the involvement of trade unions in their realization. Present at the event were the leadership of the CNSM, experts from the ILO, ITUC / PERC and trade union representatives from 12 countries of Central and Eastern Europe. The purpose of the activity was to capitalize on the role of the trade unions in the process of implementation and monitoring of SDGs’ achievement at national, regional and global level. In this context, the experts’ presentations included aspects related to the active participation of trade unions in the consultative process of SDGs on the three conventional dimensions of sustainable development: economic, social and environmental, preferably in a balanced and integrated manner. Oleg Budza, president of CNSM, believes that both social and economic policies must be complexly oriented towards creating decent living and living conditions, taking the most urgent measures and initiatives to raise the level of welfare of the country, on the realization of SDGs. Sergejus Glovackas, Desk officer for Europe and Central Asia, ILO Bureau for Workers’ Activities, conceals the role of trade unions in achieving these goals as being of major importance in the context of recognizing them as partners of trust in social dialogue. However, through social dialogue it is ensured the achievement of indicators, objectives, the strengthening of collective labour agreements and the development of effective tools to protect workers. Magnus Berge and Ariel Castro, representatives of the ILO Bureau for Workers’ Activities, presented the ILO position on the 2030 Agenda, the international situation regarding the involvement of the trade unions in the consultative process on developing national strategies on SDGs implementation. In this context, the participants of the activity made a general presentation on the realization of SDGs in their country and the degree of involvement of the trade unions they represent. According to Anton Leppik, ITUC / PERC Executive Secretary, the purpose of the seminar is to analyse the achievement of the Sustainable Development Goals adopted on 25 September 2015 by the Heads of States and Governments of the 193 countries of the UN General Assembly and contained in the “Transforming the World We Live: 2030Agenda for Sustainable Development” program. In this context, he stated that it has already become a rule that every year should be examined the stage of achievement of the 17 Sustainable Development Goals within the ITUC / PERC, to what extent their execution corresponds to the chart adopted at the level of elaboration. A broad overview of the Trade Union Reference Manual on the 2030 Agenda for Sustainable Development, was made by Evelin Toth, expert at the International Training Centre of the ILO in Turin, Italy. The participants were also actively involved in panel discussions and workgroups where they approached the international trade union work on SDGs: key priorities and areas, and modalities for action; the priority areas for capacity building for workers’ organizations and the analysis of strategic partners for the implementation of SDGs. In the end, the consultations and discussions led to the prospects of engaging trade unions at country level in the development of national work plans on the implementation of SDGs, the adoption of a common vision of the processes taking place in the region and the undertaking of commitments in their implementation in real time.